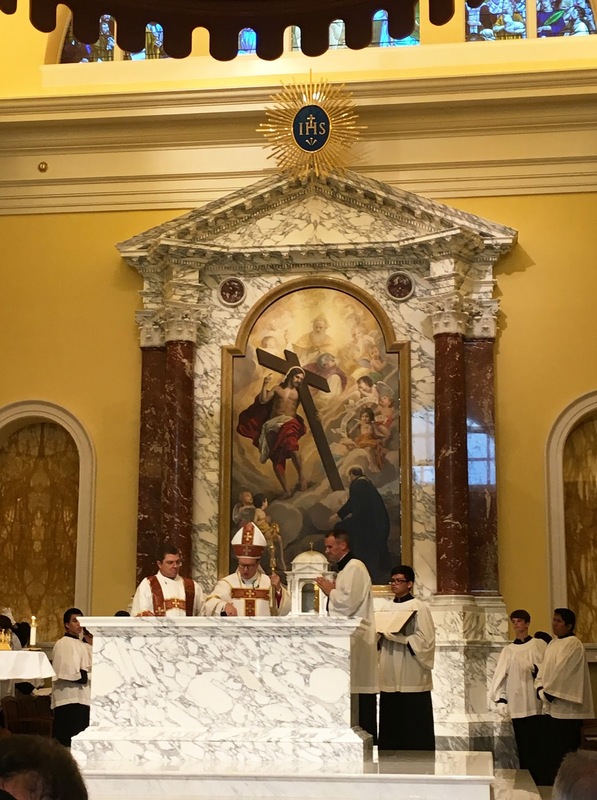 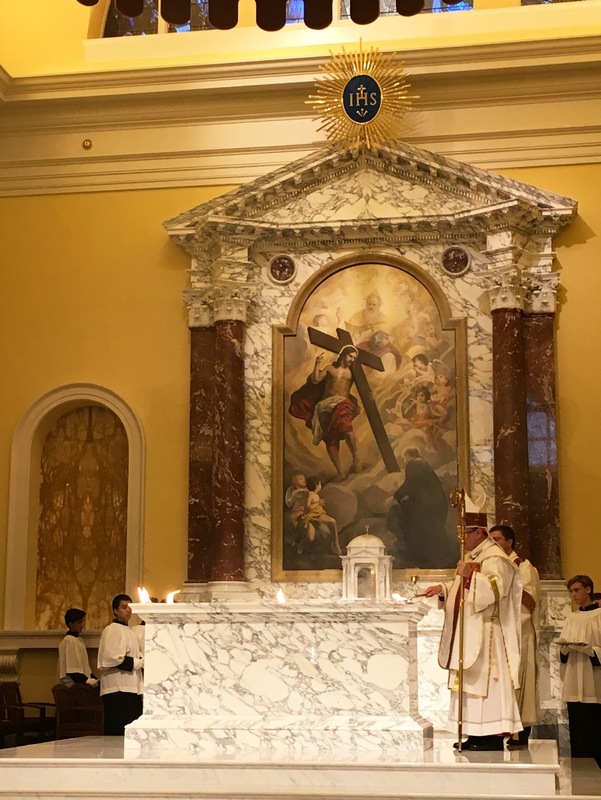 This past Tuesday, His Excellency Michael Barber S.J., Bishop of Oakland, California, dedicated a new chapel for Jesuit High School in Tampa Bay, Florida. 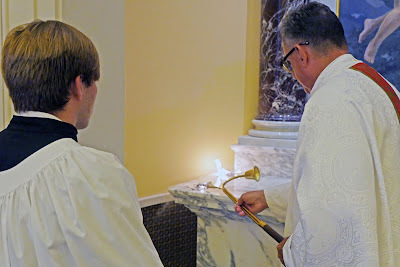 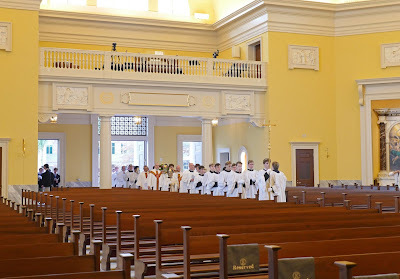 The school’s president, Fr Richard Hermes, S.J., chose August 7th as the date of the dedication because it was the 204th anniversary of the restoration of the Society of Jesus after a 41-year suppression. He and Bishop Barber spoke of the chapel as an instrument of the restoration of souls to the mercy of God, and a restoration of the Society of Jesus in America as great patrons of art and architecture. The new building was designed by architect Duncan Stroik, and replaces a previous chapel built in the early 60s, (shown below); I am sure our readers will agree that the new one is vast improvement. 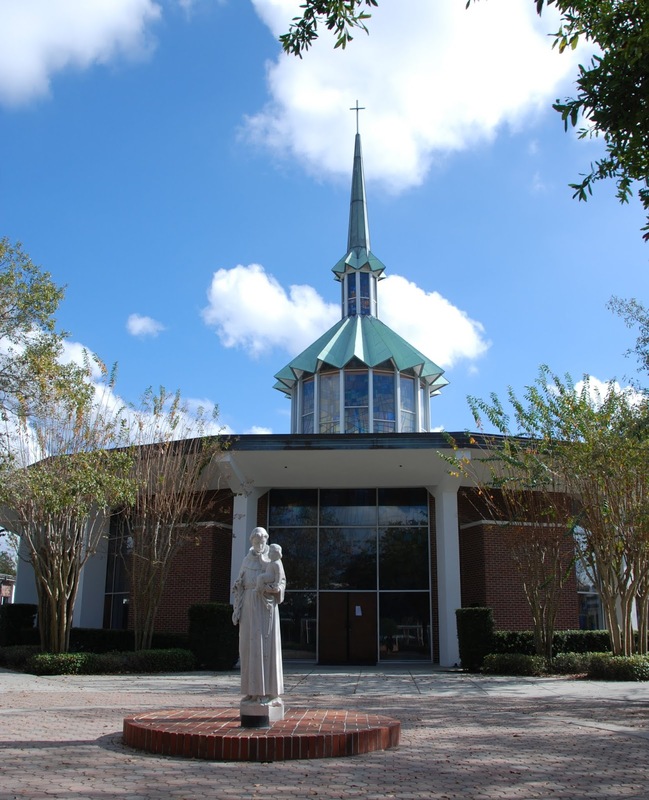 The dedication booklet also contains Fr Hermes’ statement of vision and description of the chapel. 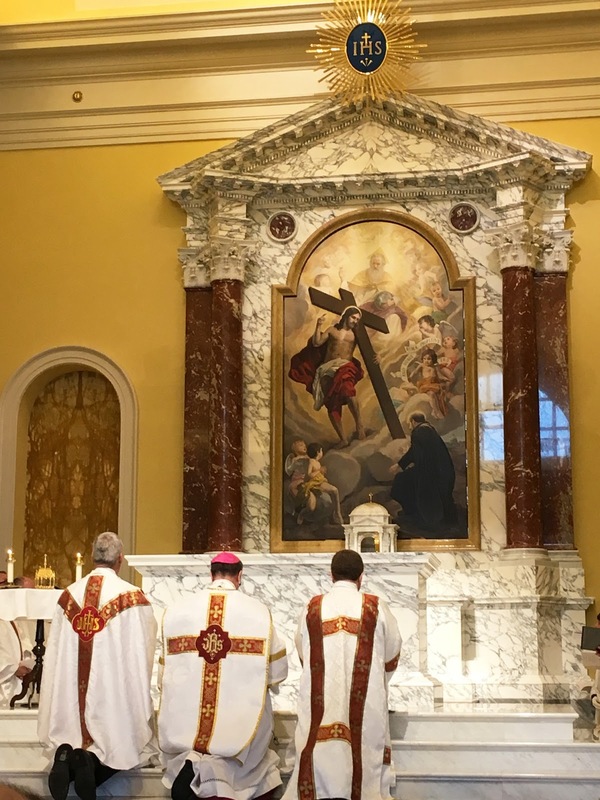 “The new chapel, named in honor of the Holy Cross, draws from the spirit that animated the origin of the Society of Jesus. 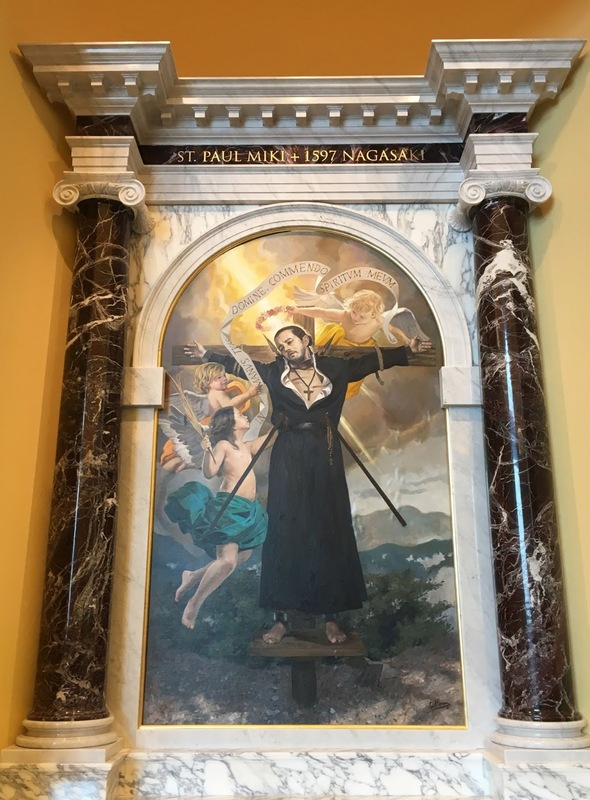 In the Formula of the Institute, the founding document of the Jesuit Order (1540), St Ignatius refers to those wishing to be members of this new Order as soldiers of God ‘under the banner of the cross’, serving the Lord alone and the Church, his spouse, under the Roman Pontiff. 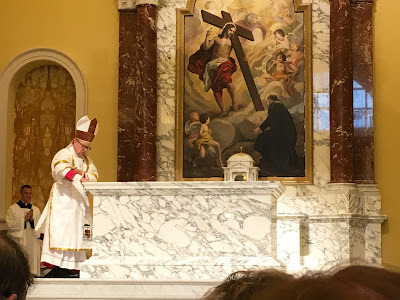 Thus, St Ignatius puts the whole Jesuit mission under the standard of the cross. 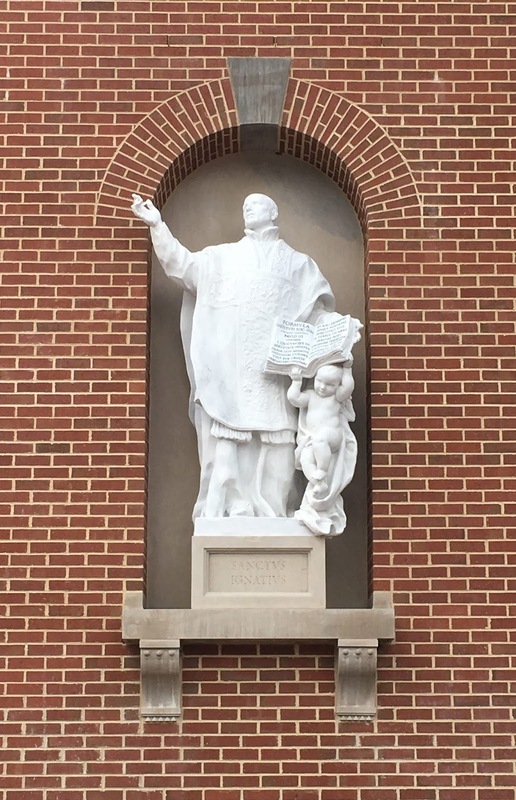 These words from the Formula can be seen inscribed on the statue of St Ignatius that adorns the façade of Holy Cross Chapel. 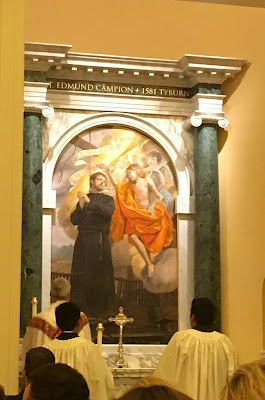 In addition, the central interior image that confronts the visitor to our new chapel, the painting placed above the high altar, is the famous image of St. Ignatius’s vision at La Storta. 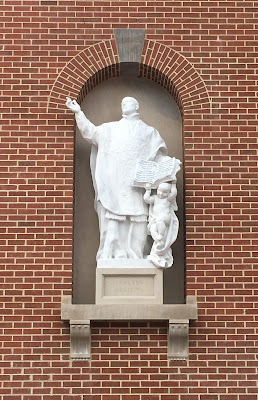 In this vision, St. Ignatius is placed by God the Father beneath Christ who carries the cross. From that moment, St. Ignatius knows that he and his companions will be linked intimately in name and mission with the Lord Jesus and His holy cross. 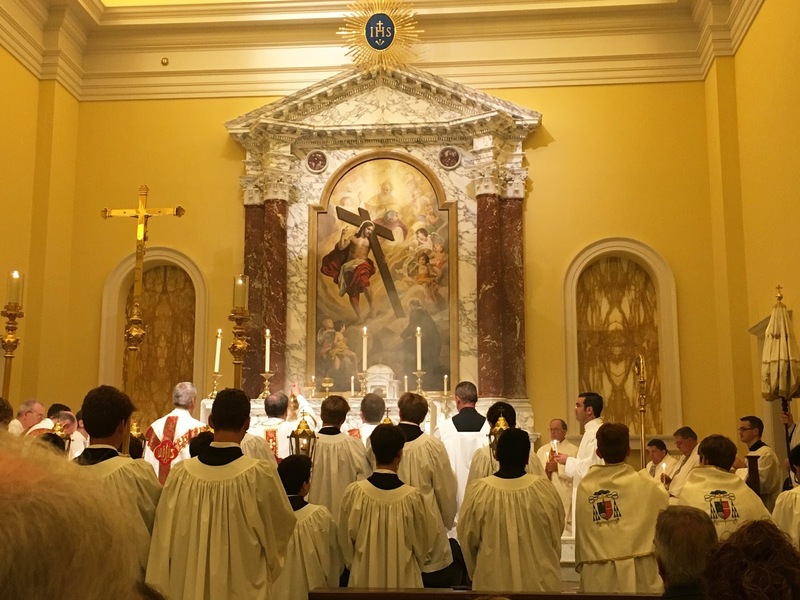 Jesuit’s new student chapel has found an architect in Duncan Stroik who is supremely fluent in this idiom of Catholic faith, tradition, and the liturgical worship of God. 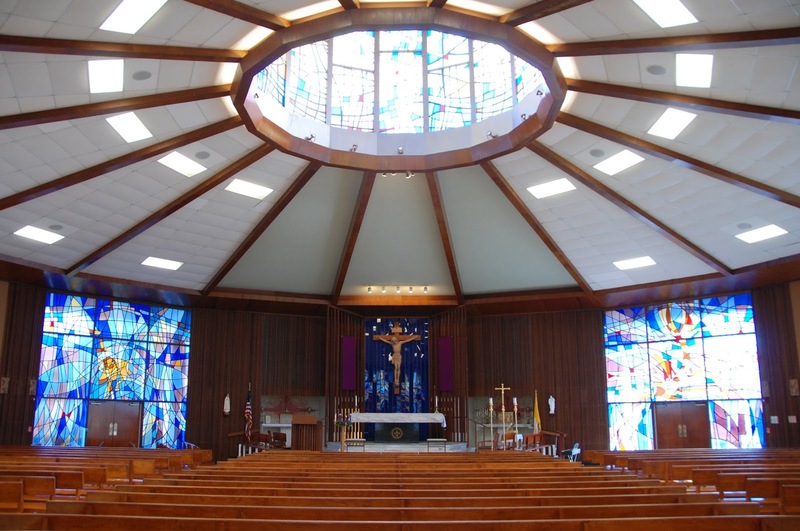 For nearly thirty years, Professor Stroik has taught architecture at the University of Notre Dame. 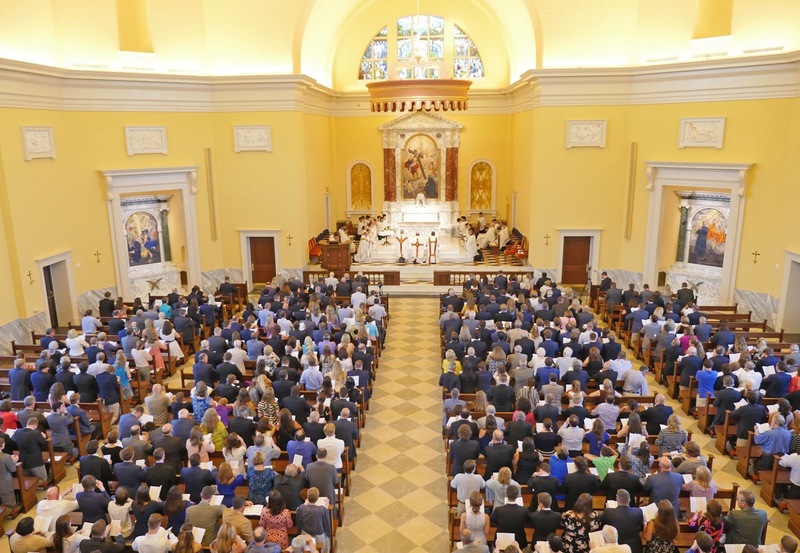 He has been a national leader in the recovery of the classical Catholic tradition in ecclesiastical architecture. 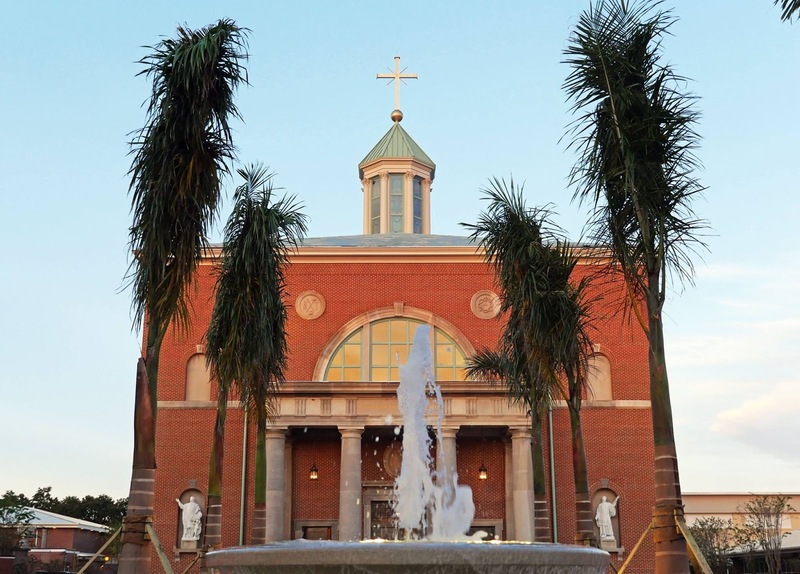 His masterful design of Holy Cross Chapel, a sacred edifice that evokes the tradition of the Italian Renaissance, will serve, inspire, and instruct thousands of Jesuit Tigers in the coming generations. The simple brick exterior, with its Palladian Doric portico and four ‘thermal’ windows, references the simplicity of early Christian and Renaissance Churches in Venice and Rome. 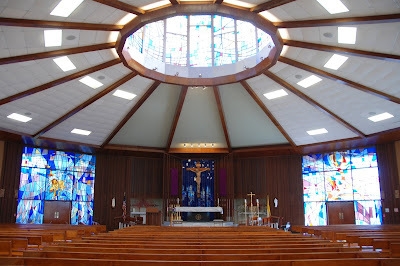 The octagonal interior echoes the polygonal shape of St. Anthony’s (the previous chapel) and connects the new chapel with the tradition of pilgrim Churches and baptisteries, including the shrine at Loyola dedicated to St. Ignatius. 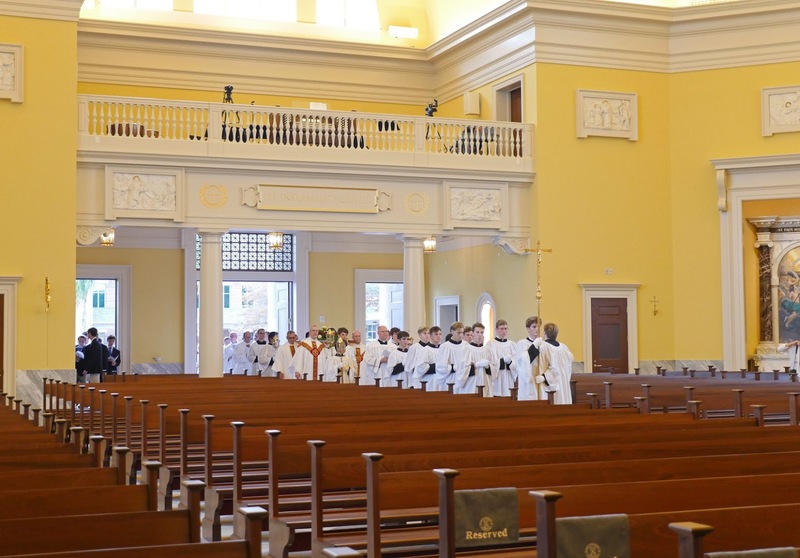 The American classical tradition, with its emphasis on stained glass interiors, also finds an heir in the new chapel. The many symbols, inscriptions, altars, and artwork reflect the great contribution of the Jesuit order to the history of sacred art. They remind us of the pedagogical function of ecclesiastical architecture, a function that complements and enhances the primary function of divine worship. 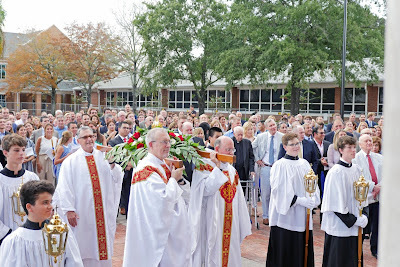 Here are more photos of the dedication ceremony.